The video below (and photo above) is of the women’s restroom in the Mumin Papa Café in Akashi, Japan. 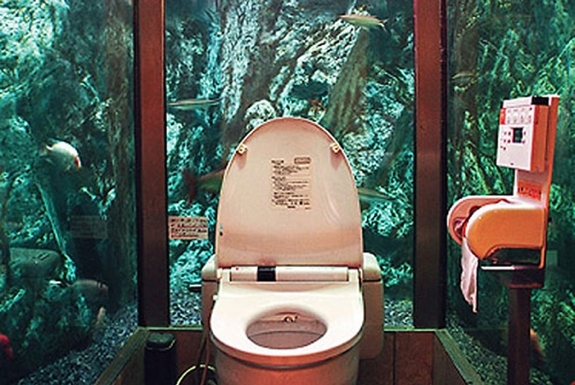 The idea behind the design, which cost US$270,000 to build, was to create the feeling of “relieving yourself while swimming in the ocean.” Nevertheless, the cafe discourages its customers from peeing in the fish tanks. It’s not unusual for upscale rural houses in Japan to have a useable bathtub located outside in a traditional garden. The owner of this house took the concept a step further, putting an entire bathroom — sink, toilet, bathtub and all — out among the backyard fauna and koi ponds. The suites at the Peace Lodge — located an hour’s drive into the hills north of the international airport for San Jose, Costa Rica — has the most amazing hotel bathroom Spot Cool Stuff has ever used. 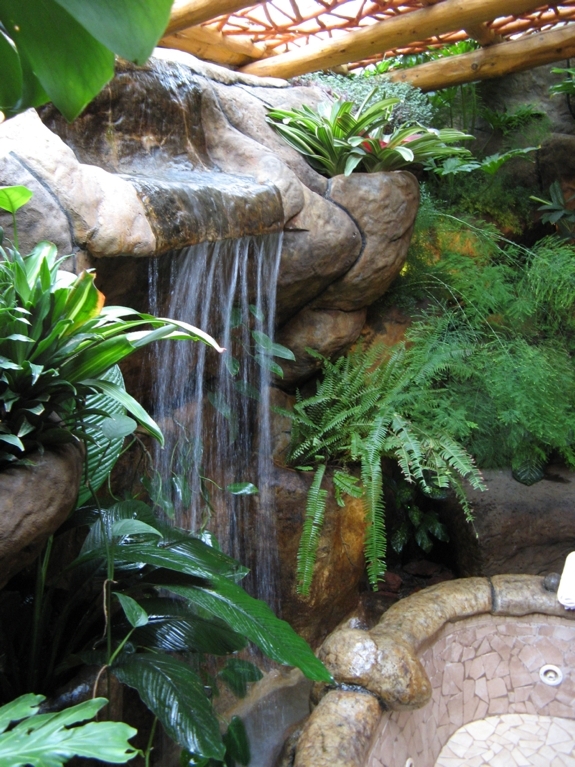 Among the cool features is this in-bathroom waterfall. A standard light switch turns it on and off. Make one wall all glass . . . 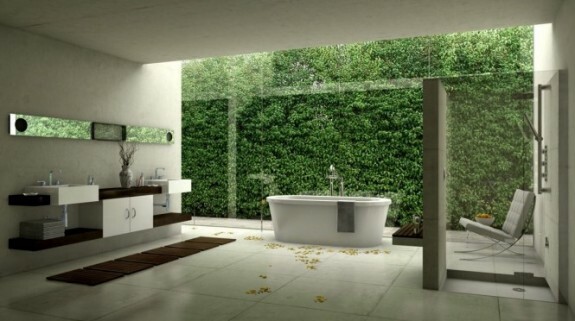 Opening up an entire wall can open up a bathroom to nature. It can also open you up to voyeurs, which is why the bathroom shown below is so cool — there’s tons of green and natural light, but also tons of privacy.
. . . or make all walls all glass . . . 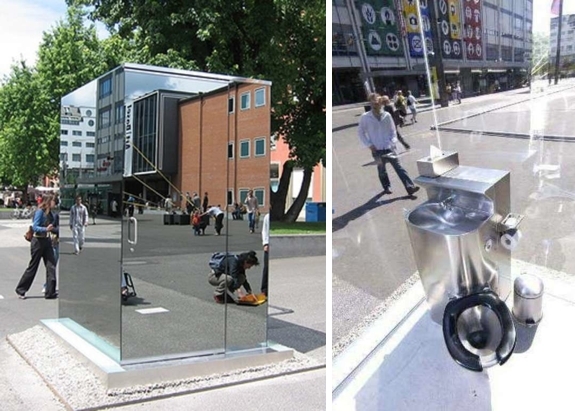 This public bathroom, a piece of art titled “Don’t Miss a Sec” by Monica Bonvicini, sat for a time outside the Tate Britain gallery in London. The bathroom’s walls are made of one-way mirrored glass — a fact you’ll have to keep reminding yourself of when you are inside with a clear view of everything around. 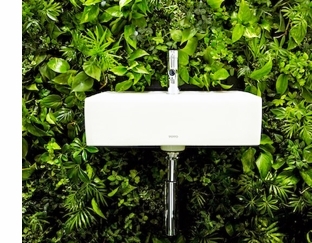 Another bathroom designed as a art project, “The Superlative Space” By Naruse Inokuma features a toilet and a sink sticking out from a wall of thick, green foliage. There’s foliage underfoot too, albeit protect by a glass floor. 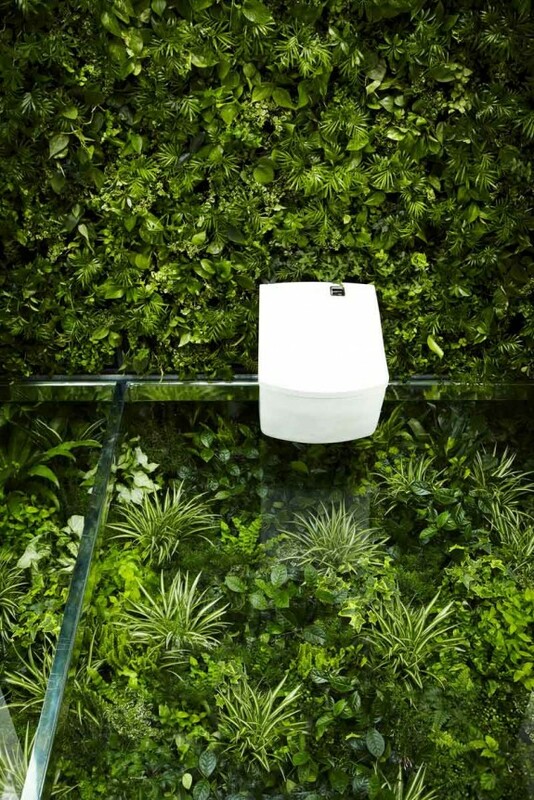 We love the look of this bathroom but worry about the bugs. 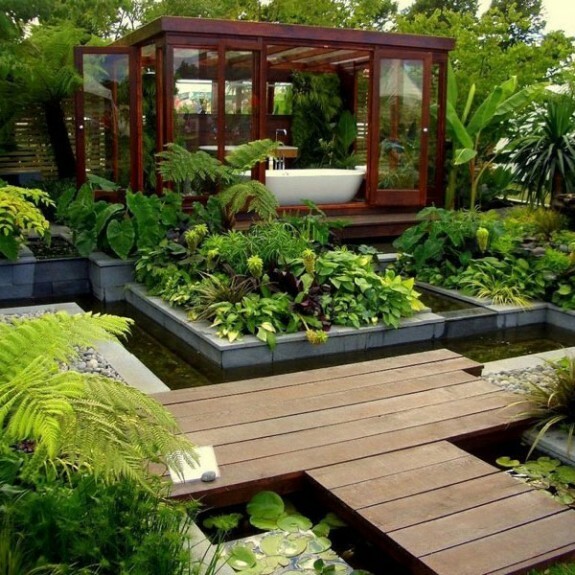 A protected space outside can make a superb location for a tub. You can test this out for yourself as the bathroom in the photo below is part of a resort. 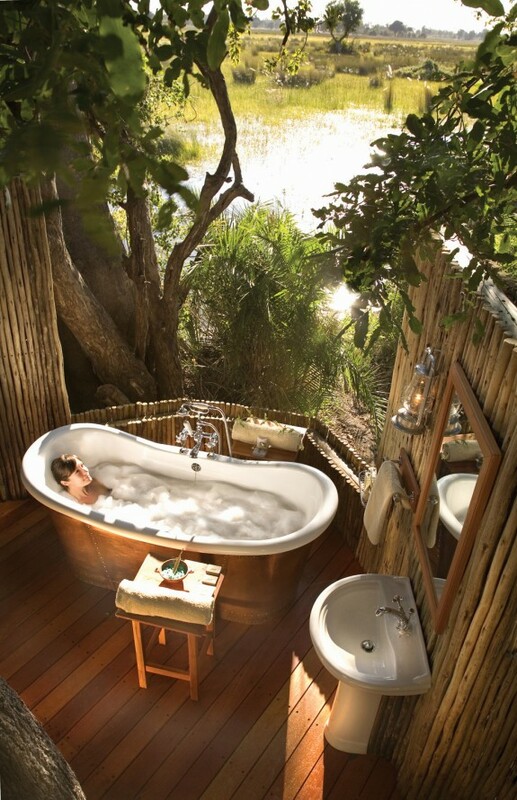 Find it at the Eagle Island Camp, which is one of the Orient Express Safari Camps in the Okavango Delta area of Botswana. There’s something about a rustic bathroom that is evocative of nature — even when there’s no greenery or much natural light. 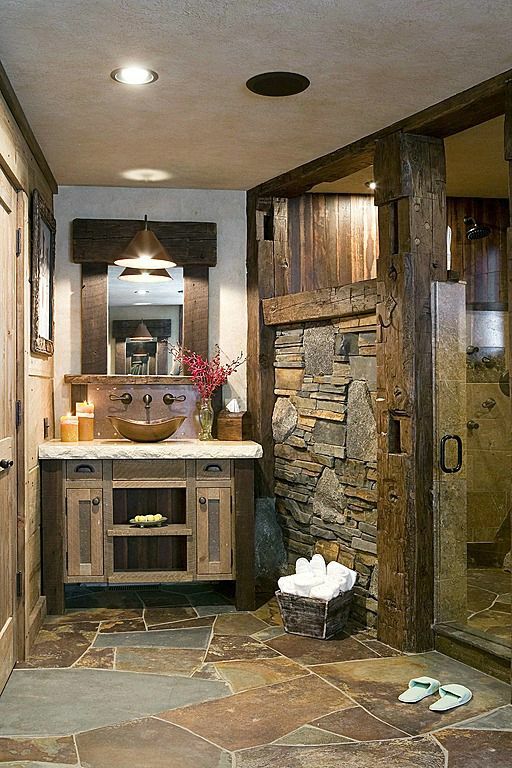 Stone, pewter and unfinished wood can add together to give a bathroom an outdoorsy country touch. Wet moss on rocks is slippery. 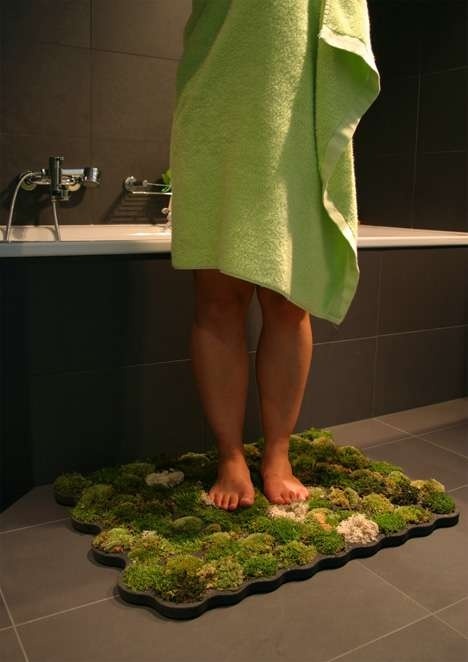 Wet moss on a bath mat feels lush and comfy. And it looks cool too! If you live in a dry climate you’d need to shower more than once per day to keep this bath mat alive. Though we’ve known people for which that would be a good thing. Click here for DIY instructions on how to grow your own. If all else fails, abandon your house and wait a decade or two. 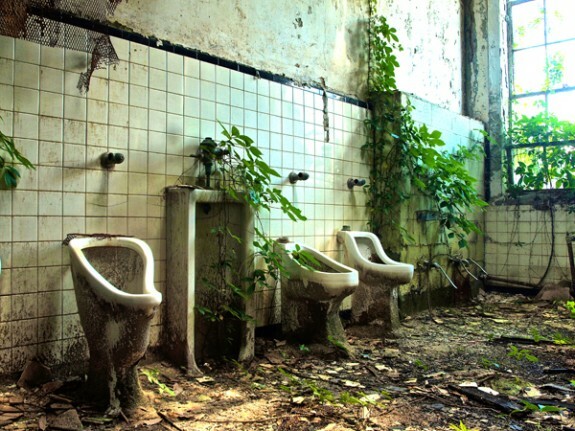 Eventually, nature will reclaim your bathroom.